Smoke alarms can keep your dog and your family safe. Here are some helpful tips from guest columnist, Wendy Nan Rees. I am writing this week's tip for two reasons, the first being that I heard a funny sound this past weekend and it took me a day to find out what it was. Second, to make sure that we all know with each season change we should do a few simple checks through our homes to make sure our pets and our families are safe. The living room in my house has 13-foot vaulted ceilings with smoke alarms. What I did not realize is that they have batteries. Unlike the home I built, these smoke detectors were not wired into the home's electrical system, and they have, shall we say, a "use by" date. That date came and that is what the sound I heard was--to let me know it was time to change the batteries. The only problem was I had no idea what the sound was or where it was coming from. Remember, it was 13 feet up in the air, in a room used for company. It took me one full day and night to find out where the sound was coming from. Every time my dogs heard the funny sound--and it was not a regular beep or buzz; it was a funny burp sound--they would all bark. So for 30 hours, I had three dogs barking, and no matter how much we looked, we could not find where this sound was coming from. Okay, this is embarrassing, because I live with a doctor. Hello? When we finally found it, how silly do you suppose we felt? I am here now to pass along, yet again, another lesson I have learned from my dogs. With all the fires that have been happening in California recently, it was lucky for us we did not have a fire in our home. As you all may not know, last week we had the largest fires on record in the history of the state of California. I have now learned that you must not only have a smoke detector in every room, you must check the batteries once a month and change them every season! Now for the funny part. Guess who had to climb the 13-foot ladder to get the old batteries out and put the new batteries in? Yes you guessed it, your pet lifestyle advisor, Wendy. How I did it I will never know but what I have learned in these past few years is that if we all put our minds to a task we surely can find a way to do it. And when it comes to our safety and the safety of our pets, then I can think of nothing more important. Please do take half an hour out of your weekend, and do a safety check around your home. You can also check for carbon monoxide emissions. You can prep your windows for winter, to seal them to help keep out the cold air, but most of all to make sure the air you are going to be breathing all winter long is safe for you, your pets and family! 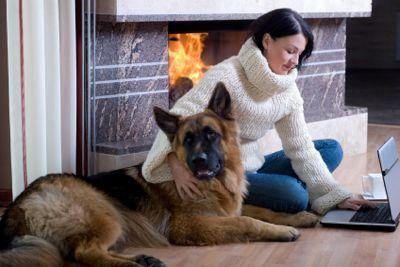 Smoke alarms and carbon monoxide detectors can help save the lives of you and your pets. Make sure that you have a working smoke alarm to help keep you and your pet safe. Test your smoke alarms(s) once a month, and change the battery at least two times a year. Keep your smoke alarm in top working order by cleaning it with a vacuum cleaner to remove any dust that may have collected on or in it. Be safe when testing your smoke alarm. Use a broom handle to test the ones that are hard to reach.